Most St. Paul storm drains lead directly to the river. They do a great job of directing water off our streets, but think of all those things that also go down the drain after it rains or snow melts. Trash, oil, road salt, and cigarette butts are all being carried into our river in large amounts. But there is a way to help. 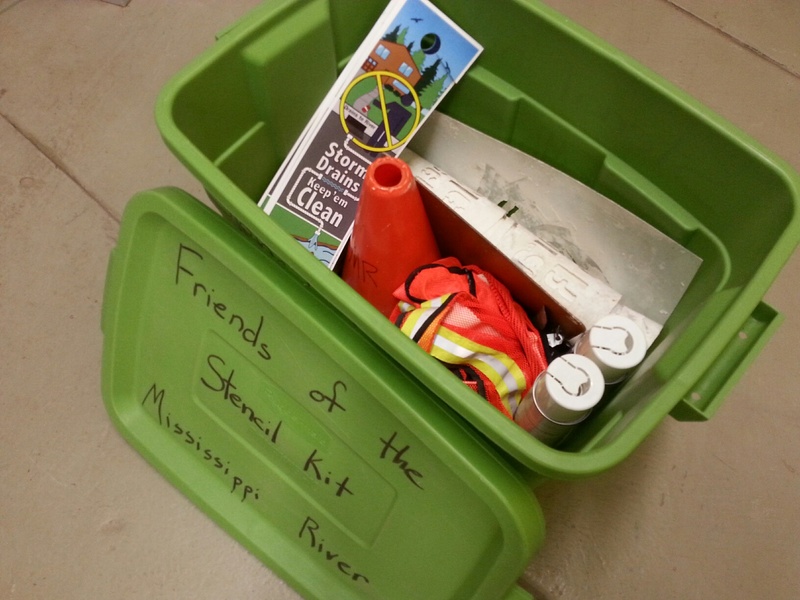 FMR works with groups to stencil storm drains with the message "Keep em' clean... Drains to River" and distribute educational flyers to local homes to help spread the word and keep runoff pollutants out of our river. It's a great way to get outside and help the river and is an excellent fit for groups looking for a fun, outdoor team-building experience with immediate results. If you have a group of 20 or more, FMR staff will meet and stencil with your group and can also provide a brief, engaging water quality presentation. See this complete description for details or go directly to the outing request form. Smaller groups can check out a stenciling kit and work with us to plan their own stenciling outing. FMR supplies bins mid-April through mid-October (weather permitting). Step 1: Sign our online liability waiver, provide your contact information and sign our pledge asking your group to agree to stencil at least 10 drains. Step 2: FMR Program Assistant Daurius Mikroberts will contact you within a week to confirm your request. Step 3: Arrive at the FMR office at the agreed-upon time to pick up your stenciling kit! Step 4: Follow the directions and maps in the bin. Groups can stencil any area within the City of St. Paul. Step 5: Return the kit and data to FMR offices on or before the deadline, which we'll set together. • Lasts as long as you would like it to. Bins can be checked out for up to one week. • Is entirely free with all supplies provided. • Must take place within St. Paul city limits. Volunteers living, attending school or working in St. Paul can usually mark drains near their homes, school or office. FMR Program Assistant Daurius Mikroberts will work with you and your group to select your location. • Can usually be coordinated within two weeks. However the number of available bins is limited so we may have to wait for another group to return theirs and plan a bit further out. Start setting up your own outing today!